Drivers are liable for parking charges they incur. The Protection of Freedoms Act 2012, sch 4 also makes the keeper liable if all applicable conditions are fulfilled. Once of these conditions is that the parking company do not know the name and address of the driver. If they do, then the keeper is not liable. Some of the more incompetent parking companies try and pretend that the keeper has only 28 days to divulge the driver name. This is not correct. The Act states that if the parking company know of the keeper name and address (by whatever means) any time before proceedings begin then the keeper is no longer liable. (b) is unable to take steps to enforce that requirement against the driver because the creditor does not know both the name of the driver and a current address for service for the driver. 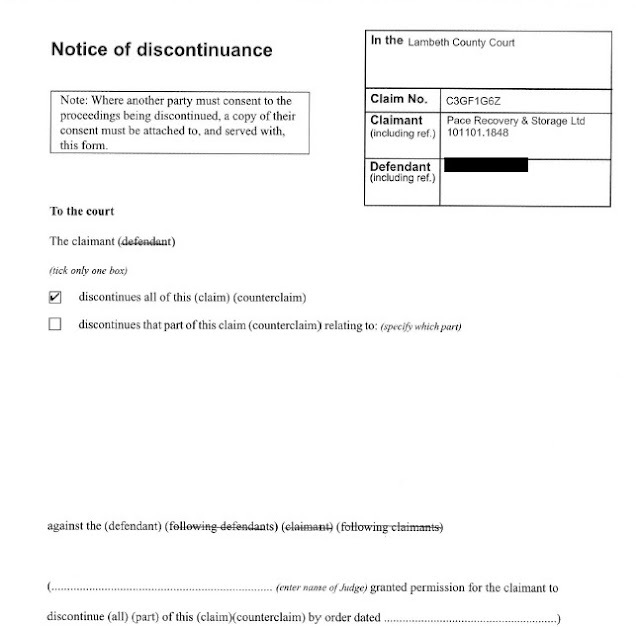 (2) Sub-paragraph (1)(b) ceases to apply if (at any time after the end of the period of 28 days beginning with the day on which the notice to keeper is given) the creditor begins proceedings to recover the unpaid parking charges from the keeper. Therefore, if the keeper gets a letter before claim stating that proceedings will begin in 14 days if no action is taken, this is probably the keeper's last chance to discharge their responsibility by naming the driver. This happened in the case of Pace Security v Mr K. Gladstones sent a letter before claim to Mr K on 14 September 2016. Mr K responded to that letter on 15 September, naming GV as driver and giving their address. Mr K was from the point the letter was received no longer liable. GV received a letter before claim on 28 September, proving that Gladstones had received and fully understood the response. Surprisingly (or perhaps not, for those readers familiar with Gladstones) Mr K also received a claim form. He filed a defence stating he had provided the driver name and address and was therefore not liable. The case then dragged on until January 2017, at which point Gladstones finally gave up. Gladstones continue to find new and creative ways to demonstrate their legal incompetence. Amazingly, the same people who run Gladstones are allowed to run the IAS and the "Independent" Appeals Service. It really does make a mockery of the whole "Alternative Dispute Resolution" process that such a bunch of inept bunglers are allowed to be in charge of an appeals system. Mr K should consider whether he has a valid data protection claim against Pace Security, who have apparently used his name and address in an unlawful way. The going rate seems to be between £250 and £750. The case against GV drags on. It is interesting to note that a number of parking companies who used to use Gladstones in the past, no longer appear to be issuing claims. Given Mr Charman's history of losing court claims The Prankster wonders how long he will stick with Gladstones. Sadstones are nothing if not consistent. Where is that, their spare room or the table in the corner of the kitchen?